Ninja Media Script – Viral Fun Media Sharing Site Is a powerful running a VIRAL Media Sharing Site, This script is very powerful and easy to use. 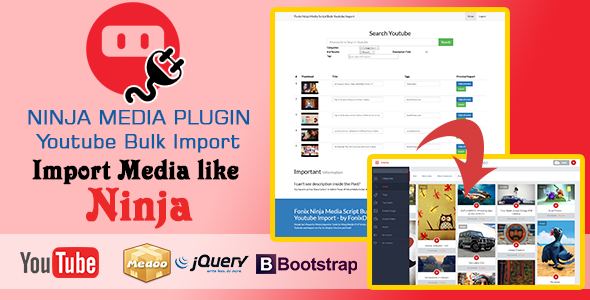 “BULK YOUTUBE IMPORT FOR NINJA MEDIA” Help you to import bulk youtube video to your website, you have 100% control over importing media. Display Results with Thumbnail, Editable Title and Tags, as well as Lighbox Preview before Import. Script Don’t display results which already in database (so no duplicate). Everytime New post points will be added to Admin. Standalone Installation did not change a single file or Databsae structure in “ORIGNAL SCRIPT”. Secure and Simple Login System. I can’t see description inside the Post?